Just think, in a single generation, people have had to change the way they access information and businesses have had to adapt to entirely new technologies to compete on a global scale. That’s why some of the biggest challenges large businesses face today are best addressed by a combination of the two; people and technology. Whether you are an enterprise organization or a small business the best work flows out of a collaborative environment. “Privia is used by our management team to holistically manage opportunities and operations of a contract vehicle. All in one location. Priceless." - Yevette B., DigiFlight, Inc. Whether you are challenged by islands of experts or silos of information, you have new business to win and Privia can help. Deploy Privia in your secure IT space and across your organization or deploy Privia within sensitive environments, including Sensitive Compartmented Information Facilities (SCIFs). 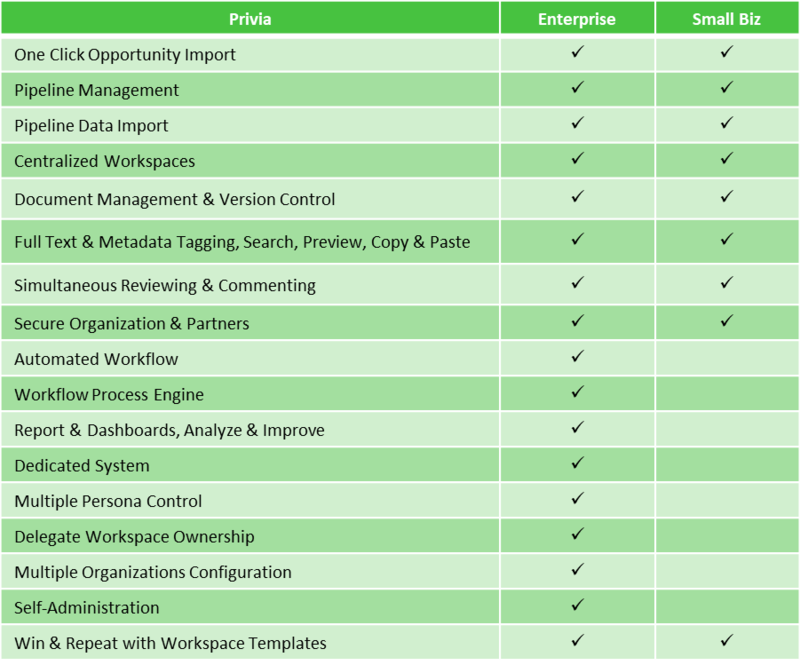 Access Privia securely from the Cloud and avoid on-premise set-up and implementation. Access Privia securely from the Government Cloud, including the audited reports, compliance certificates, and attestations necessary to demonstrate compliance, with the same economy of scale and data security the cloud delivers. Whether you’re challenged by a small staff or information overload, Privia has a solution for you - pre-configured, out-of-the box to avoid start-up costs and accelerate your implementation. Increase throughput by as much as 30%, while simultaneously improving proposal compliance. Privia provides comprehensive tools to help proposal development professionals manage and track the hundreds of concurrent, company-wide tasks involved in responding to government RFPs and task order requests. A standard Cloud implementation delivers software access with no hardware to provision. We provide access to the software, infrastructure, maintenance and operations and you focus on winning. Get started for just $29/month per user, including training and support. Whichever Privia solution you choose, our team will collaborate with yours each step of the way, leveraging our proven methodology to tailor the best approach for a successful launch and to ensure you are using Privia and best practices to their full potential. Once the software is setup and acceptable to the customer, our experts coordinate and deliver user training designed to familiarize all members with the software and your process. Each training module includes live demos (that allow users to follow along), standard training guides, electronic user documentation, and online self-help. Privia provides Go Live Support, for example the handling of initial questions and support usage. Our Professional Services team will then follow-up with you on a 30, 60, 270 day interval and provide additional training as needed. Privia organizations have access to our Customer Support experts to address questions or technical issues. Monthly webinars provide ongoing Privia and best practices training on a variety of topics aimed at leveraging your investment and improving your team’s efficiency. Our technical experts can free up your proposal time by administering Privia for you, so you can concentrate on pursuing, winning, and implementing new business. Our team of experienced proposal managers, volume leads, technical writers and editors, and production leads can augment your team at any stage of the process to maximize your team’s potential. Learn More About Privia Today!